Spotify Songs Greyed Out? Fixed! Q: Why are some songs greyed out on Spotify? In this morning, I launched Spotify app to search favorite music tracks, there are some songs greyed out in the search results. As result, I can't play these Spotify songs. The same situation happens when I access to them on Spotify web player, mobile devices as well as desktop client. As one of the largest streaming music platforms around the world, there is no doubt that Spotify is a professional and popular streaming music service. But subscribers on Spotify still could meet some problems and errors while playing Spotify songs, such as 'Spotify greyed out songs', 'Spotify Error Code 4' and so on. But please don't worry. In this article, we will introduce the reasons why you will meet songs greyed out on Spotify and show the effective workarounds to fix this issue without effort. If you can listen to Spotify songs before without problem, but now they are greyed out and you can't listen to them anymore. There are three reasons that could be caused this situation. 1. Connection Error. If the Internet connection is unstable when using Spotify desktop client, it will also lead Spotify songs not available. Besides, please make sure the 'Offline Mode' is turned off. 2. Network Matters. If you are using Spotify app on mobile devices, you might have carelessly shut down the cellular data usage for Spotify. 3. Regional Block/Country Limits. It's important to note that not all Spotify songs are available in all countries. If you have traveled to another country and some Spotify tracks greyed out occasionally, it means that these tracks are unavailable in the country you are being in. This can't be controlled by Spotify but it's up to the individual music companies. The above factors can prevent free and paid subscribers from playing music, playlists and albums on Spotify. Fortunately, no matter which situation you are, there is a solution to fix the Spotify songs greyed out problem. Let's check the detailed guide out! To open the cellular data usage for Spotify app, please enter to 'Settings' > 'Cellular' option and then scroll down to turn 'Spotify app' on. Step 1. Under the 'Network & Internet Settings' section on your computer, please make sure the Internet connection is normal and clear up any possible or existed Internet barriers. Step 2. Also, you'd better to check whether Spotify app is in the whitelist of Internet Connection Firewall. If not, please modify it. Step 3. In the Spotify app, please navigate to the 'Settings' option from the top-right menu bar, scroll down to 'Display Options' section, and then you will see there is a 'Show unavailable songs in playlists' button. Please turn it on. Spotify is available in a wide variety of countries, like Americas, Australia, New Zealand, China, etc. However, some special songs are unavailable in some countries due to the individual music companies. Under such circumstances, please make sure your VPN network is connected to the supported areas. Tip 1. Check whether the VPN service is not expired yet, if you are using a premium VPN network. Tip 2. You'd better to connect your VPN network to American or European services, since it has better song compatibility in such countries. Tip 3. You can have a try to switch to another VPN service to see whether it does work. The issue of network connection could be the biggest killer on Spotify songs greyed out. So why not download Spotify songs and playlists offline in advance? Moreover, if you can access to Spotify greyed out songs in your country, why not download them as MP3 while they are available? After that, you will be able to listen to Spotify downloads as you like without having to care about Internet issue and region issue. Even you can play Spotify songs offline on any device without Spotify app. To download Spotify music to computer, it can't be easier to just subscribe Spotify Premium plan to get the 'Download' option. Alternatively, if you are using a free Spotify account, you can also download Spotify playlists to MP3 with a third-party Spotify software, such as AudFree Spotify Music Converter. 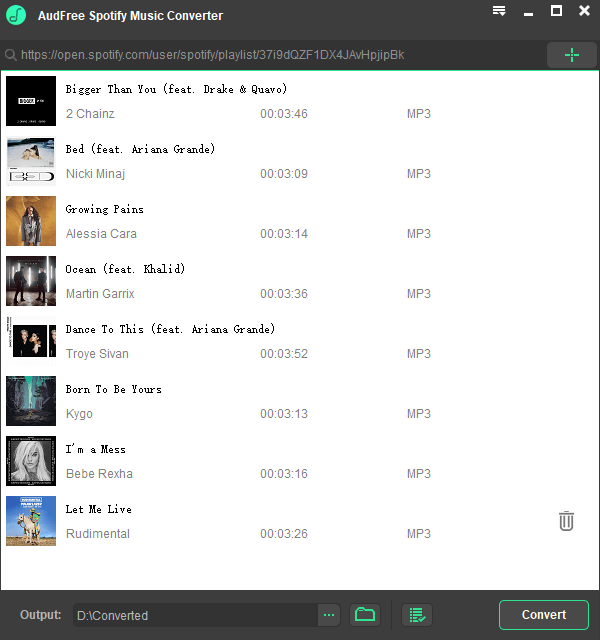 It works well to download Spotify music offline and convert them to MP3, FLAC, WAV, AAC and other audio files with zero quality loss at 5X faster speed. 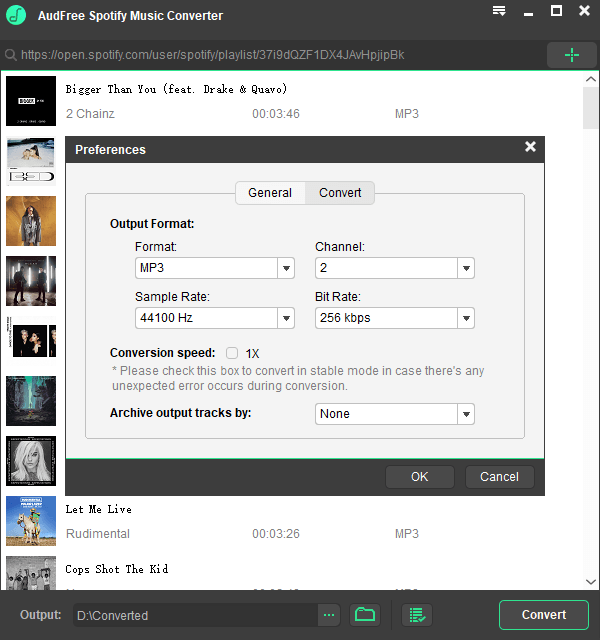 As AudFree Spotify Music Converter works for both free or premium Spotify users and can convert Spotify files to MP3, here, we will give the complete tutorial to download and save Spotify songs offline with AudFree program. 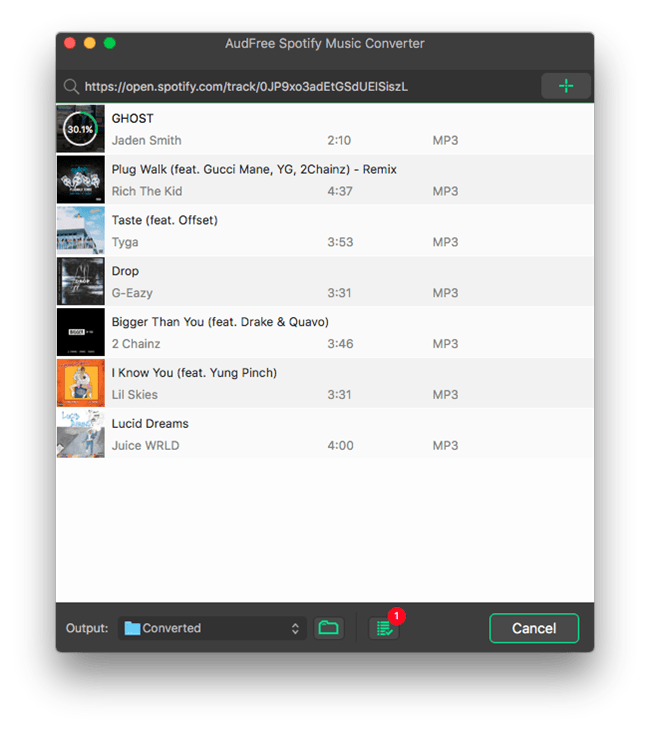 Run AudFree Spotify Music Converter on your Mac/Windows computer and Spotify app will be loaded automatically. Just drag and drop Spotify songs from Spotify app to AudFree's main interface or copy and paste Spotify URL to the search box and click 'OK' to import them. As MP3 has the higher compatibility and can be supported by almost all devices and music player, you're suggested to define output format as MP3 by clicking the 'Preferences' > 'Convert' button. In the opening window, you can also customize other output audio parameters, like bit rate, sample rate, etc. Simply press the 'Convert' button at the bottom-right corner of the main interface of AudFree, you will see the real-time conversion process in the conversion window. Just wait for a while, and you can locate Spotify MP3 offline music on your computer by touching the 'file' icon. When you get Spotify MP3 downloads, you can share and transfer them to any device and player for playback. No matter where you go, you won't meet Spotify songs greyed out and you can listen to Spotify tracks even without Internet connection.